“It’s not hype,” Orioles right fielder B.J. 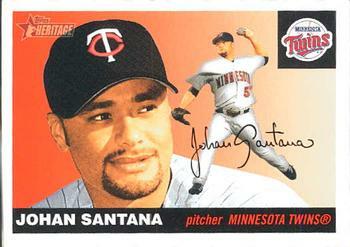 Surhoff said of Twins pitcher Johan Santana after the September 19, 2004 series finale at the Metrodome in Minneapolis. “He’s that good.”1 En route to his first Cy Young Award, the left handed Venezuelan dazzled the afternoon crowd in his last home start of the regular season by striking out 14 and walking none, lowering his league leading ERA to 2.65. It had been an eventful season for the Twins leading up to this game, as they were on their way to a third consecutive American League Central title. Popular players including Eddie Guardado, Eric Milton and A.J. Pierzynski had left the team in the offseason, while #1 overall draft pick and Minnesota native Joe Mauer made his Major League debut at the Metrodome on April 5. Off the field, former Twin Paul Molitor (also to serve as Twins manager from 2015-2018) was inducted into the Baseball Hall of Fame in July 2004. Fast forward to autumn baseball, where the Twins came into the September 17-19 series with Baltimore leading the AL Central by 13 ½ games with a record of 86-60. Previewing the series, the Star Tribune highlighted the key matchup between Santana and Orioles superstar shortstop Miguel Tejada, who was hitting .304 with 27 home runs and 126 RBI.2 Twins pitching faltered in the first two games of the series, with the Orioles winning 11-2 and 12-3 respectively. On Saturday, Twins right hander Brad Radke lasted only three innings, necessitating the use of five relief pitchers to complete a three hour, 24 minute slopfest. Santana had built his Cy Young credentials by compiling extraordinary second half numbers, going 11-0 with a 1.27 ERA and holding opposing batters to a .148 average since the All-Star break. Interestingly, Santana did not make the All-Star team that year, as he was only 7-6 with a 3.78 ERA in the middle of July. The Twins' lone representative was closer Joe Nathan with 23 saves and a 1.13 ERA by the All-Star break. Going into his start against the Orioles, Santana was leading the league in ERA (2.76, nearly 60 points ahead of Cleveland’s Jake Westbrook at 3.33), second in wins with 18 (two behind Boston’s Curt Schilling) and leading the league in strikeouts with 240 (27 ahead of Boston’s Pedro Martinez). Although Baltimore had beaten the Twins in the first two games of the series, they were not a factor in the American League East race — at 69-77 they trailed the division leading New York Yankees by 23 games. With a lineup including perennial slugger Miguel Tejada, infielder Brian Roberts and veterans Tim Raines and B.J. Surhoff, Baltimore was the number three hitting team in the American League with a .282 batting average. Following the only extra base hit the Orioles would get in the game (a first inning double by Tim Raines) and the only time Santana would go to a full count with any opposing batter (first batter of the game Brian Roberts), he proceeded to use a fastball, slider and changeup to make professional hitters look helpless. The Orioles #1 and #2 hitters in the lineup struck out three times each. In the top of the 8th, Santana struck out the side on ten pitches. The Twins left hander struck out at least one batter in every inning and 12 of the 14 strikeouts were swinging. An announced crowd of 31,399 saw Santana throw 78 out of 103 pitches for strikes over eight innings — an almost unbelievable 76%. It was fortuitous that Santana was brilliant that day, as the Twins lineup had trouble with Orioles starter Bruce Chen. The fellow lefty had only given up four hits and two runs through six innings before a two run homer in the 7th inning by left fielder Michael Restovich gave Santana more than enough breathing room. With 103 pitches over eight dominant innings, would Twins manager Ron Gardenhire allow Santana to go for the complete game shutout? After a lengthy bottom of the eighth by the Twins offense, Gardenhire decided to summon Joe Nathan for the top of the ninth, even though, as the score was then 5-0 it was not a save situation. The arrival of the All-Star closer on the mound was greeted with a chorus of boos although it was clear Gardenhire had an eye on the Twins postseason plans. “You all want to see a shutout,” Gardenhire said. “I want to see him healthy.” “He made the right decision,” Santana said.5 Nathan did give up a run in the ninth inning but then struck out designated hitter Jay Gibbons for a 5-1 Twins victory, which lowered their magic number for clinching the AL Central division title to two. The game lasted only two hours, 17 minutes. The Twins clinched the AL Central title the very next night (their season would end with a loss to the Yankees in the Division Series) and Johan Santana would go on to become the third Twin to win the American League Cy Young Award. He garnered 140 points, far ahead of Curt Schilling in second place with 82. The lefthander finished the season with a record of 20-6, a 2.61 ERA and 265 strikeouts with only 54 walks, a nearly 5:1 strikeout to walk ratio. He led the league in ERA and strikeouts and was second in wins to Schilling’s 21. In addition to the notes below the author wishes to thank those involved with the Baseball Reference website for putting this game information online and helping her re-visit the best pitching performance she has ever seen in person. 1 Ray Richardson, “One more to go: Santana puts Twins on title threshold,” St. Paul Pioneer Press, September 20, 2004: 9D. 2 Jim Souhan, “Inside the Series: Key matchup,” Minneapolis Star Tribune, Friday, September 17, 2004: C12. 3 Patrick Reusse, “All of Venezuela is claiming Santana,” Minneapolis Star Tribune, September 20, 2004: C12. 4 Powers, Tom, “Fans envisioned a complete game,” St. Paul Pioneer Press, September 20, 2004: 9D. 5 Jim Souhan, “Striking a pose: home crowd roars as Santana’s arsenal quiets Orioles’ bats,” Minneapolis Star Tribune, September 20, 2004: C11. 7 Jim Souhan, “Santana, back for Hall honor, recalls receiving, not giving,” Minneapolis Star Tribune, August 4, 2018: C1.